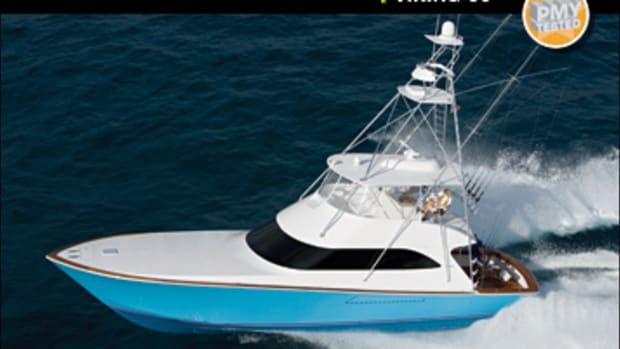 The Southern California-based Manroe family hit February’s Miami International Boat Show to see 18-year-old Kyle receive The Billfish Foundation’s Junior Angler Award. When you see Kyle’s fishing record, you understand why he received it. 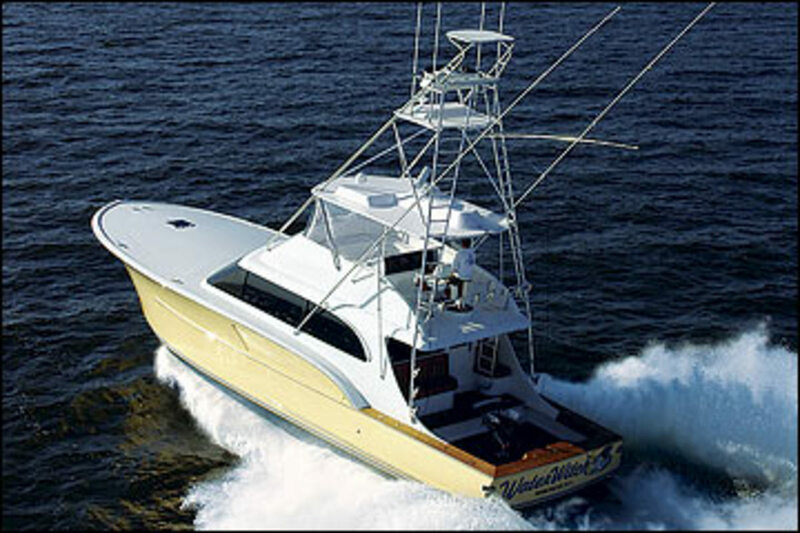 The Manroes—Kyle fishes on a team with his father Bob—won the Auto Exotica-Bisbee’s East Cape Offshore Tournament in 2004 with a 386-pound blue marlin and a 197.7-pound yellowfin. The year before, Kyle took the dorado division with a 50-plus pounder. 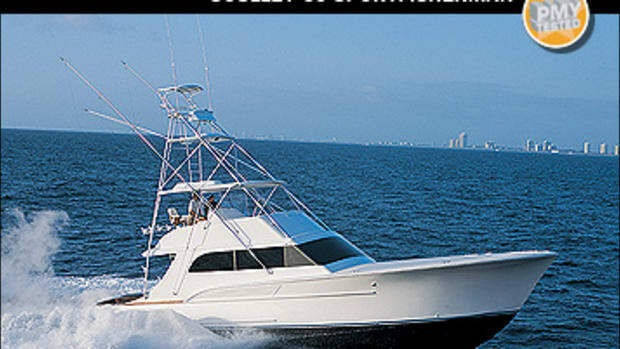 The list of catches goes on, like the half-dozen striped marlin the pair caught on Christmas morning while fun fishing. No wonder this family put 2,600 hours on their two-year-old 43-foot sportfisherman. These guys use their boat. 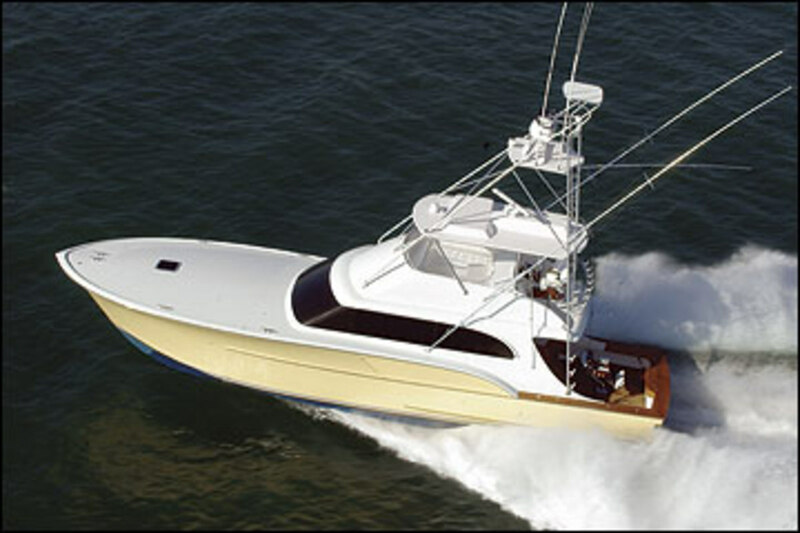 So when Jim Sculley, Jr. of Sculley Boatbuilders said the Manroes had noticed his cold-molded 60-footer, Water Witch, the day before my scheduled test of her and were coming along for a ride, I thought it’d be a great chance to learn what West Coasters think of East Coast custom boatbuilding. The South Florida morning air was warm, and the sun’s rays were piercing the optional three-side Strataglass enclosure. 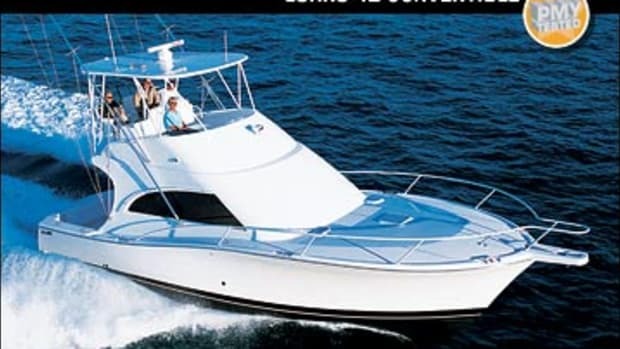 The Manroes arrived shortly after I did and, being avid boaters, moved directly to the flying bridge, as the standard Caterpillar 1,650-mhp diesels warmed up (1,825-mhp Cat 32As are optional). There was plenty of room for Kyle, Bob, Sculley Jr., and me to spread out, even with my obtrusive Pelican case full of batteries, an inclinometer, a computer, a radar gun, and other assorted test paraphernalia sprawled about. The lounge seating forward of the helm, which is fitted with custom Release seats, could easily seat six or eight adults. Underneath the seating is some serious fish-gear stowage for rods, gaffs, and the like. If that’s not enough room, my test boat had rod stowage in the custom Bausch hardtop, an area that’s not usually used. Talk about making the most of available space. 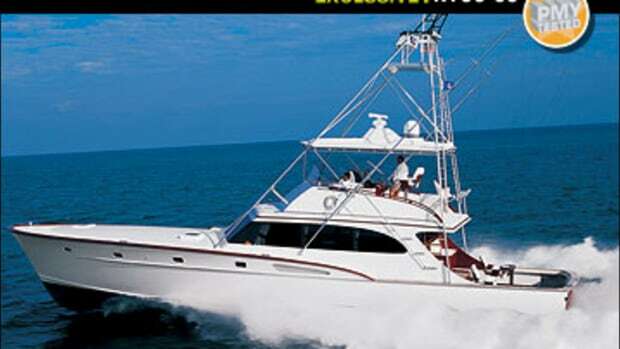 In fact, this boat holds 64 big-game rods and reels and you don’t see one in plain view. 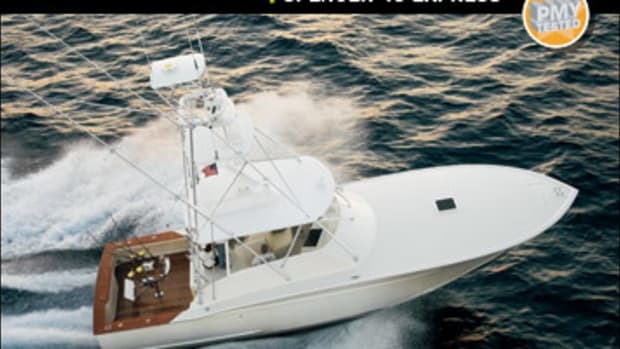 While looking over the helm, I noticed the ram-assisted console, which is a great feature that offers protection for the optional Furuno, Northstar, and Simrad electronics onboard. All displays were easily readable from the stool-type helm chair. I’d want one with a cushioned and supportive back, like Water Witch’s companion seat, as I do a lot of 200-plus-mile, troll-all-day trips. But this boat was actually Jim Sculley, Sr.’s personal battlewagon, and he likes this chair. Sculley Jr. opted to stand on the helm’s raised teak platform as he engaged the single-lever Glendinning electronic controls, and Water Witch easily motored out of her berth at about 6 knots. 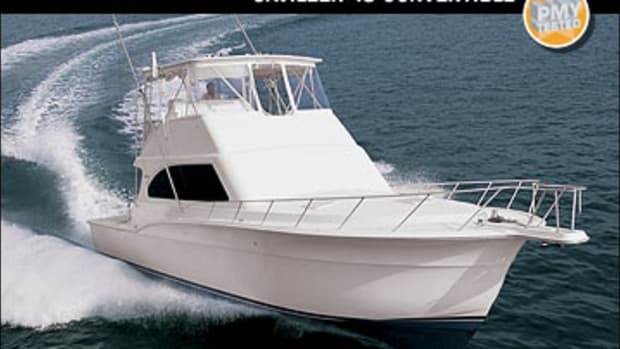 She’s equipped with trolling valves, which can reduce speed to about 2 knots; this is a nice feature for calm-water, close-quarter handling or, in the case of the Manroes, live-bait fishing for big marlin. After running the numbers, it was time to feel this boat from the helm. I put the throttles forward, and Water Witch offered a gradual ascent to plane (see acceleration curve). Once over the hump, she continued a steady stride to WOT and tracked straight with little wheel input. The seas had no impact on her ride. There wasn’t a bump or a thud to be had, even when I put the power-assisted wheel hardover and she turned at WOT in about two and half boat lengths. Kyle enthused, “That was some turn.” I looked back at Bob, who was sitting in the companion chair smiling. I thought the sea trial was going well for them, too. After some more at-speed maneuvers, I took the boat back to neutral to see how Water Witch drifted in a swell, which she did quite well. Her roll was relaxed and gentle, and I felt little movement at the helm. At deck level, I imagine, there would be almost no movement. I finished my run and asked Kyle and Bob if they wanted the wheel. Bob, still smiling, declined. But Kyle wanted to back down the boat. He stood on the platform, faced the cockpit, grabbed the controls, and put them in reverse, and the 60 accelerated to about 7 knots. 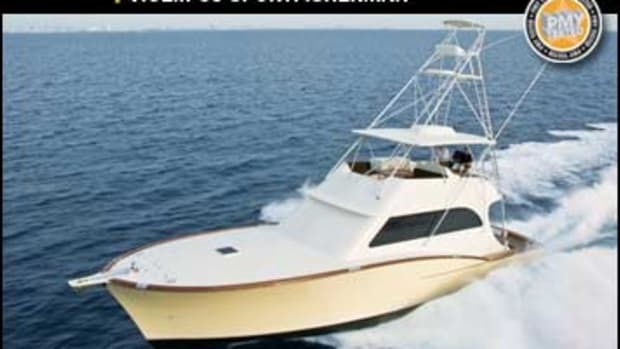 I could see Kyle envisioning a marlin slashing about as he braced against the boat’s teak coaming and water poured over the back of the transom, up to the mezzanine area, turning the golden teak cockpit sole into a saltwater swimming pool. He thought it was “cool.” Sculley Jr. wanted to show Kyle just what this boat was capable of and, after taking back the wheel, backed Water Witch down with a vengeance. Teal water flew over the transom, and the high-water alarms began blaring. The water quickly evacuated through the efficient down-angled scuppers. I looked at Bob and saw he was wearing a smile even bigger than the one before. 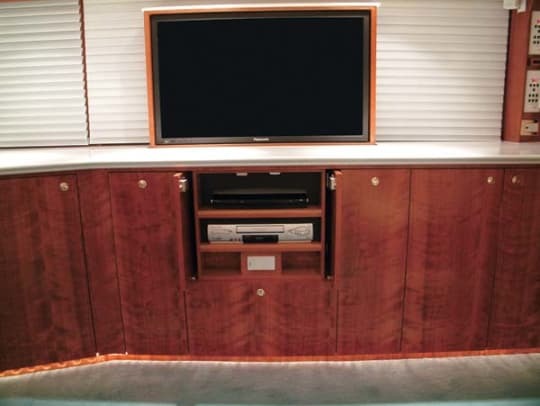 Once the deck cleared, I headed to the saloon to check out an interior finely finished in satin and high-gloss cherrywood, as well as high-end equipage from Sub-Zero and Kitchen-Aid in the galley and Panasonic and Bose in the saloon and three staterooms. (A fourth “semi-stateroom” with bunks is located in the below-decks’companionway). All the staterooms have LCD TVs with on-demand entertainment. 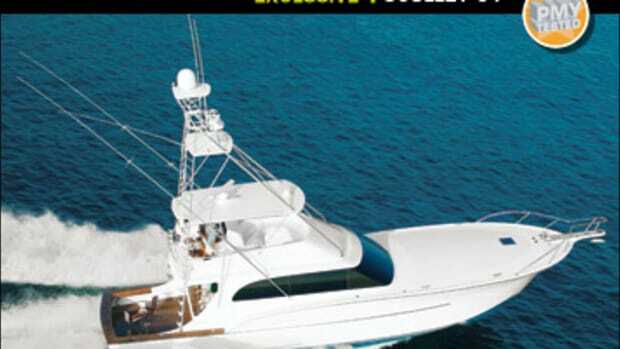 Not too shabby for a “fishing” boat. And speaking of fishing, our boat was tournament-ready with stainless steel fishboxes, livewells, optional electric reel outlets, a Hoshizaki ice maker, 41-foot Rupp outriggers, and a 15-foot Rupp center &apos;rigger, as well as a tuna door, Release fighting chair, underwater lights, and electric teaser reels; and of course, that copious rod stowage. Water Witch is 68,000 pounds (loaded) of pure battlewagon. So what was the West Coast take on East Coast custom boatbuilding? I stopped by Sculley’s slips later in the afternoon following the test to pick up some media materials and noticed Bob and Kyle onboard a new Sculley express. They were chatting and enjoying a cool drink. 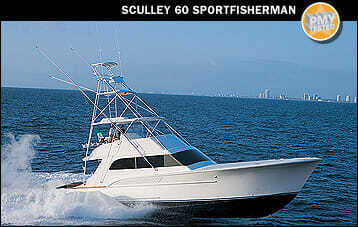 Bob was still smiling, and they were also celebrating the fact they had just purchased their own 54-foot Sculley. I guess that says it all. 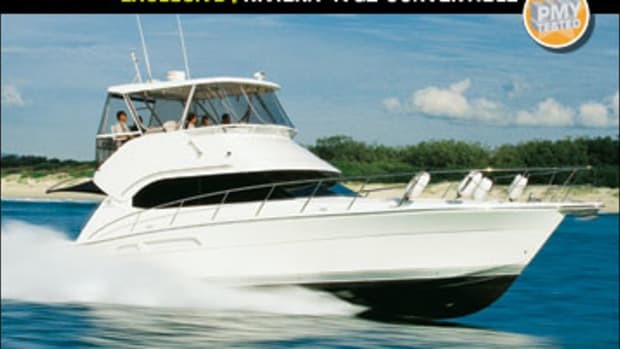 cedar-lined stateroom lockers; LCD TVs in guest and master staterooms; 42” plasma TV in saloon; Bose Lifestyle 48 home-theater system; Corian countertops; Sub-Zero drawer-type refrigerator and freezer; four-burner Kitchen Aid electric cooktop; 24,000-Btu saloon A/C; central vacuum; queen-size walkaround berth in master; cherrywood interior; fuel-tank sight gauge; dripless shaft and rudder seals; trim tabs w/ recessed actuators; wraparound flying-bridge seating; teak covering boards; transom door; high-volume scuppers; cockpit tackle center; stainless steel top-loading bait freezer.